What Is the Shure KSM8 Microphone? Who Is the Shure KSM8 Mic Designed for? 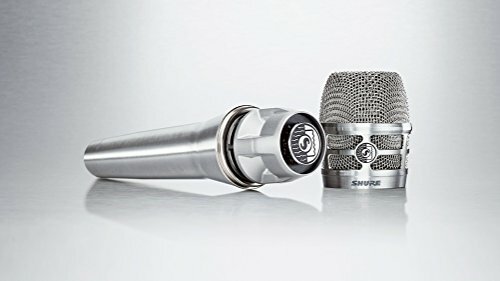 What’s Included with the Shure KSM8 Mic? Conclusion – Should You Get the Shure KSM8? The Shure KSM8 is one of the most-recommended professional dynamic microphones available. It is also one of the first mics to include a dual diaphragm design. The KSM8 is a professional dynamic mic designed by Shure. Shure remains one of the leading manufacturers of microphones and other audio gear. With the KSM8, Shure has included their patented DUALDYNE design, which incorporates two ultra-thin diaphragms, along with an inverted airflow system. The Shure KSM8 mic also features a cardioid pickup pattern, which is the most common pick-up pattern for vocal mics. However, the KSM8 offers superior control of the proximity effect. Thanks to careful calibration and design, the KSM8 provides greater range and natural sound reproduction. 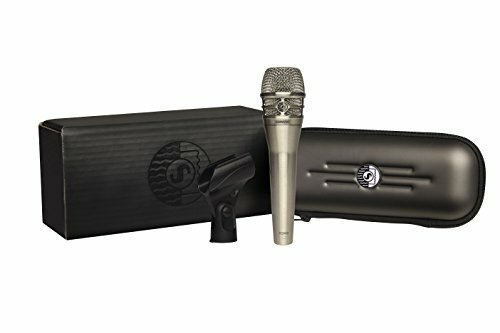 Besides the dual-diaphragm design and the fine-tuned calibration, the KSM8 includes a variety of features that help make it one of the top professional mics. The KSM8 is built with a metal case and features a dent-resistant carbon-steel grille. Along with a durable outer construction, the internal components are designed to withstand abuse and movement. The dual diaphragms are supported by an advanced stabilization system. These details help make the KSM8 almost indestructible. The total size is less than 10-inches long and 3.5-inches thick. It is a sturdy mic that does not feel too heavy or too light, weighing just over 1.5 pounds. The Shure KSM8 was released just two years ago in January of 2016. Two years later, it has not been updated. However, most customers agree that this mic does not need any major improvements. When designing the Shure KSM8, the company focused on creating a superior microphone for vocalists. The KSM8 includes the dual diaphragm design. One diaphragm is active while the other is passive, providing a controlled proximity effect. The true cardioid polar pattern, diaphragm stabilization system and pneumatic shock mount help deliver natural sound reproduction for live or studio vocals. The price tag on the KSM8 places this into a higher category of professional microphones. It may be a little too expensive for novices or beginners looking for their first microphone. 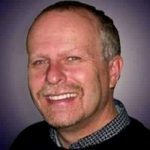 Churches may also find it difficult to justify the purchase of this expensive mic for their sound systems when there are suitable options available at a fraction of the price. Microphones do not need to appeal to all consumers. 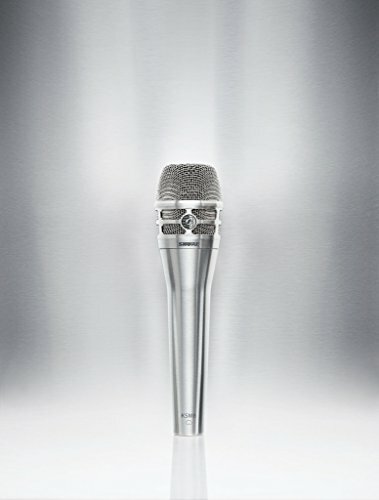 The Shure KSM8 is designed and priced for experienced musicians and producers that want the very best sound for vocals. The Shure KSM8 includes several standard accessories in the box. Along with the microphone, you get a zipper bag, microphone clip, and user guide. The KSM8 also includes a microphone stand adapter, allowing you to easily use the microphone with any standard microphone stand. Like most microphones, a windscreen is not included. However, the grille is lined with a hydrophobic woven fabric. This material helps protect against wind, water, and moisture. The primary feature of the Shure KSM8 microphone is the dual diaphragm design. This is a unique design with a removable cartridge containing two ultra-thin diaphragms. The pneumatic shock mount is a useful feature that reduces handling noise. With a handheld microphone, a vocalist may move around on the stage a lot. For these situations, you need a microphone that can help eliminate excess noise without limiting the low-end frequency response. The shock mount provides these features. The diaphragm stabilization system and hydrophobic woven fabric on the grille also help with the elimination of unwanted noise. The stabilization system prevents pops and noise from handling and protects the diaphragms, while the lined grille cover protects against wind. The grille is also impact resistant. It is made from durable, dent-resistant carbon steel that is hardened for added protection. The case itself is also extremely well-built and able to withstand impact from multiple drops, ensuring that the mic lasts for many years even in the roughest environments. It is hard to find any complaints about the Shure KSM8 microphone. Everyone that buys this microphone tends to love it. However, some people question the price of the microphone. It typically costs several times the price of some of the most popular Shure handheld microphone. The price tag may be high, but you tend to get what you pay for. With the Shure KSM8 microphone, you get more control over the proximity effect and a fuller, more natural sound. It is hard to find a direct alternative to the Shure KSM8 microphone, due to its quality. However, if you prefer condenser microphones and want the same superior sound produced by the KSM8, you may want to explore the KSM9. The Shure KSM9 is also a handheld vocal microphone with a dual diaphragm design. It features metal components and carefully crafted parts. While it is comparable to the KSM8, it does have one major difference in the design. The KSM9 is a condenser microphone and the KSM8 is a dynamic mic. The condenser mic tends to offer a more natural sound when external noises are less of a problem. The Shure KSM8 has many strengths and only one drawback. The one issue that some people may have with this microphone is the price. It typically costs over $400, which may put it out of reach for some musicians. However, the price does reflect the quality. When you spend this much on a microphone, you hope to get phenomenal sound, which is what you get with the Shure KSM8 handheld mic. It is incredibly durable and capable of being dropped without major damage. 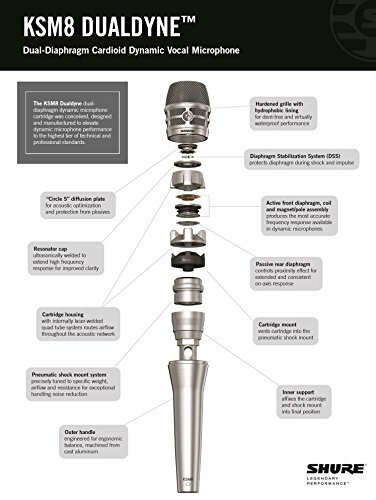 It also has a unique dual-diaphragm design and diaphragm stabilization system. These features ensure that you always get the most natural sounding vocals.